Selkie is a perfect cat of unknown age and origin, with seal-point Siamese markings. Selkie's page finally includes a picture! Selkie also has a LiveJournal account. 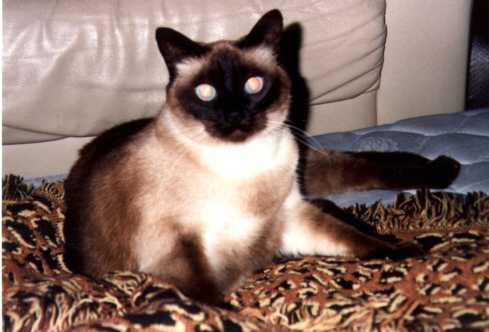 Read about traditional apple-head Siamese cats. Selkie came to me from The San Francisco SPCA, via the cat rescue organization Community Concern for Cats. So I don't know whether she is a traditional apple-head Siamese, but she has many of the characteristics of one. Want your own Meezer? Check out the Siamese Rescue Alliance. I volunteer at an animal shelter. This page includes suggestions about how to combat pet overpopulation and has pictures of cats I got to know who sadly did not find new homes. Have Kleenex handy.